I think my child has a learning disability, WHAT do I do now? Is my child eligible for Exceptional Student Education? My child has been evaluated and found to have learning disabilities, WHAT do I do now? If you just can not agree, you can almost always appeal! What if the school district says that my child is ineligible for accelerated programs because of his / her disability? I think my child may have a learning disability, WHAT do I do now? Request that your child be evaluated for learning disabilities. Please refer to the Sample Evaluation Request Letter for suggestions as to the content of your request. In Florida special education services are provided by and compliance is monitored by the Exceptional Student Education (ESE) Department. The following links are to the Exceptional Student Education Departments in Pinellas County, Pasco County and Hillsborough County. Most likely your request to have your child evaluated should be given to the ESE liaison or coordinator at your child's school; but, it is best to contact the school and ask where and to whom your evaluation request should be sent. It is always best to make a request for evaluation in writing and for you to deliver your request in person. However, that is not always possible. Second best strategy is to send your request via U.S. Mail, certified, return receipt, requested to the person designated by the school district with copies via regular mail to your child's school principal and guidance counselor. Federal law sets forth a frame work of requirements that states are required to implement for their public schools systems in order to assure that all children have access to a Free Appropriate Public Education (FAPE). One of the requirements states must implement is the necessity to respond to a parental request for an evaluation to determine if their child is a child with a disability. The initial evaluation must be conducted within 60 days of receiving parental consent for the evaluation or, if the State establishes a timeframe within which the evaluation must be conducted, within that timeframe. Either timeframe described does not apply to a school district if the parent of a child repeatedly fails or refuses to produce the child for the evaluation; or the child enrolls in a school of another public agency after the relevant timeframe has begun, and prior to a determination by the child's previous public agency as to whether the child is a child with a disability. The screening of a student by a teacher or specialist to determine appropriate instructional strategies for curriculum implementation shall not be considered to be an evaluation for eligibility for special education and related services. Evaluation requirements of the IDEA are addressed at 20 U.S.C. 1414, explained by Section 300.301 CFR and incorporated in Rule 6A-6.0311 of the Florida Administrative Code. Information on the Florida administrative rule pertaining to procedural safeguards for Florida students with disabilities are outlined in this Rule Implementation Brief which implement the IDEA requirements of 20 U.S.C. 1415, as explained by Section 300.121 CFR. or developmentally delayed in Rule 6A-6.03027, F.A.C..
Pinellas County uses this Eligibility Criteria Indicators form to capture the results of their assessment. Make sure you understand the criteria language and note which of the criteria is applicable and appropriate to your child's evaluation and take that information with you to the determination meeting. General information on the Florida administrative rule pertaining to eligibility for ESE services is outlined in this Rule Implementation Brief. The Individuals with Disabilities Education Act (IDEA) and the Section 504 of the Rehabilitation Act of 1973 are the two federal laws addressing education rights of children with disabilities and require public school systems to provide every child with a Free Appropriate Public Education (FAPE). Both laws require that learning disabled children receive all special education classes and related services, assistive technology and evaluations required to make the necessary determinations as to the needs of the child, at public expense. The purpose of the IDEA as stated in 20 U.S.C. 1400(d)(1) is to "ensure that all children with disabilities have available to them a free appropriate public education that emphasizes special education and related services designed to meet their unique needs and prepare them for further education, employment, and independent living." The IDEA provides federal financial assistance to state and local education agencies to guarantee early identification and protection of eligible children 3-21 who are determined by a multi-disciplinary team to be eligible within one or more of thirteen specific categories of disability and who need special education and related services. Categories include autism, deafness, deaf-blindness, hearing impairments, mental retardation, multiple disabilities, orthopedic impairments, other health impairments, serious emotional disturbance, specific learning disabilities, speech or language impairments, traumatic brain injury, and visual impairment. The National Center for Learning Disabilities publishes an excellent IDEA Parent Guide that provides a comprehensive review of the IDEA process. The Rehabilitation Act is a civil rights act prohibiting discrimination by activities, public and private, that receive federal financial assistance against individuals with a physical or mental impairment that substantially limits one or more major life activities, including children and adults with ADD and ADHD. Major life activities include, but are not limited to, self-care, performing manual tasks, seeing, hearing, speaking, breathing, learning and walking. Section 504 covers only those persons with a disability who would otherwise be qualified to participate and benefit from the programs or other activities receiving federal financial assistance. With respect to education the Act requires that eligible children receive a Free Appropriate Public Education (FAPE), defined as an education comparable to that provided to students without disabilities. The NCLB Act requires states to establish and monitor their student's progress towards challenging academic content and achievement standards. States must also implement appropriate teaching strategies and student support such that all student's progress towards the standardized academic goals with the aim of ensuring that no child fails or is left behind. The Act promotes highly qualified teachers and imposes strict penalties for under performing schools. The importance of the NCLB Act to children needing ESE services is that it imposes specific requirements if the school intends to apply alternative (see 34 C.F.R. 200.1(d)) or modified (see 34 C.F.R. 200.1(e)) academic standards for their child. My child has been evaluated and found to have learning disabilities, WHAT do I do know? Once your child has been evaluated and found to be a child with a disability, then the school will meet with you to discuss an educational plan. I possible, it is best for both parents to be involved and attend these meetings. The best thing you can do for your child is to arm yourself with as much information as you can about your child's disability. Search on-line for information about manifestations of your child's disability that you have observed and for examples of possible accommodations. If possible, make a list and consider the alternatives against your knowledge of how you child might react. Do not assume that just because one method worked for a child somewhere, it will work for your child. You might also consider some great advice I recently heard from the exceptional student services compliance person for my local school district, who recommended parents ask their children for their input and opinion as to what they think would work for them, what accommodations they think will assist them, what rewards they want which would motivate them. Obviously parents cannot turn over the entire decision making process to their children, but you can involve them in the process with great results. Accommodations under Section 504 should be uniquely based upon your child's disabling conditions and what your child needs in order to have an equal educational opportunity. The ultimate goal is to give students the knowledge and compensating skills they need to be able to function in life after graduation. Pinellas County utilizes this from for Section 504 Accommodation Plan. If your child is eligible for an Individualized Education Plan (IEP) the U.S. DOE published A Guide to the Individualized Education Program. Since the guide was written, the IDEA was reauthorized. The US DOE's website has more information on IEPs. Florida' DOE published a companion IEP guide called Individual Education Plans and IDEA '97. In addition to accommodations an IEP identifies specific goals and objectives to help provide an appropriate education. Pinellas county utilizes this form for an IEP. General information on the Florida administrative rule pertaining to developing IEPs is outlined in this Rule Implementation Brief. The best educational plans require constant monitoring for adherence and assessment for suitability. Both the IDEA and the Rehabilitation acknowledge and support the review and modification of the educational plans. Unfortunately some schools and teachers are not as diligent as they should be in following the educational plan they agreed to implement. And sometimes what seemed like a great accommodation simply does not fit the child or the environment. Parents need to fill the role of champion and advocate for the implementation of their child's educational plan. Be proactive and contact the school anytime you think that there is a problem that needs to be addressed, including accommodations that are not being followed or are simply not working for your child. Sir Francis Bacon said "Knowledge is power." And this is especially true when dealing with school district bureaucracies. The more you know of the laws, rules and policies that define the bureaucracy the better prepared you will be to successfully negotiate, advocate and demand the attention that the laws require for your child. Research the state statutes implementing the IDEA and the Rehabilitation Act as well as the policies and procedures propagated by the state and or local school district. Then when an issue arises you will know your rights and those of your child and be able to assert them for your benefit and or deflect any incorrect assertions or statements made by the school, faculty or staff. Before you go to any meetings, it is advisable that you are aware of information provided by the Bureau of Exceptional Education and Student Services of the Florida Department of Education in the pamphlets entitled Notice of Procedural Safeguards for Parents of Students with Disabilities and Dispute Resolution State Complaints. One of the reasons you want to make your request to have your child evaluated in person is that you can request from the school any information and / or materials they have pertaining to special education. Alternately, many schools publish their materials on line, so a bit of Googling may find it. One of the items you should receive is a disclaimer or parent rights statement that should include the information you need to initiate an appeal of an adverse decision made by the school, educational plan committee and or the learning disability assessment pertaining to your child. Avenues of appeal should include a judicial or legal appeal and a non-judicial appeal to a person, office or department responsible for reviewing such decisions. Parents are free and encouraged to represent themselves and their children on either path. The principal benefits of a judicial appeal are that it is a hearing before an administrative law judge, who is usually someone outside the school district, with specific legal rights attached to the presentation evidence and a set burden of proof that the parties to the appeal are required to meet in order to make their case. If these terms are unfamiliar to you, then parents may want to consider speaking with an attorney about their situation and possible representation. What if the school district says that my child is ineligible for accelerated programs of his / her disability? The Office of Civil Rights has issued a Dear Colleague Letter indicating that student disabilities do not render a child per se ineligible for Advanced Placement and International Baccalaureate classes or programs (accelerated programs) under both Section 504 and the IDEA. The Family Educational Rights and Privacy Act (FERPA) was enacted to set out requirements for the protection of privacy of student's educational records and the dissemination of any personal information contained therein. FERPA allows the disclosure of directory information, but not when linked to personal information or to third parties without prior consent. Schools may not require a parent to use private health insurance to pay for or defray the cost of any services necessary to provide a child with a free appropriate public education under IDEA; schools may access private insurance only with the parent's informed consent. Each time a school would like to use a family's private insurance, it must obtain informed consent and explain to the child's parents that they may refuse to allow their insurance to be used, and that any such refusal will not relieve the school of its duty to ensure that the child receives all necessary services at no cost to the family. The rules under IDEA regarding the use of insurance are different for children who have public insurance, such as Medicaid. They do not expressly require schools to obtain informed consent from a parent before tapping a child's Medicaid or other public insurance. However, with a few exceptions not relevant here, both IDEA and the Family Educational Rights and Privacy Act (FERPA) require schools to obtain parental consent before disclosing information from a child's education records to outside parties such as a Medicaid or other public health insurance agency. Therefore, while the school may not need consent to tap into a child's public insurance benefits, it will need informed parental consent before it can pass along the information it needs to disclose in order to do so. Under IDEA, "consent" means that the parent has been fully informed of all relevant information, in her native language or other mode of communication; that the parent understands and agrees in writing; that the consent describes what the school district seeks to do, and lists the records that will be released and to whom; and that the parent understands that giving consent is voluntary, and that she can change her mind at any time. By virtue of these requirements, parents should have advance notice of the school's efforts to use a child's public health insurance to pay for special education services, and an opportunity to prevent any related disclosure of information from the child's education records. In addition, before tapping a child's Medicaid or other public health insurance, the school district must make sure that tapping the child's public health insurance will not decrease available lifetime coverage or any other insured benefit, or result in the family paying for services that the child needs outside of school, and that otherwise would be covered by the public insurance program, or increase premiums or lead to discontinuation of the insurance, or risk loss of eligibility for home and community-based waivers, based on total health-related expenditures. School personnel acting without the participation of the child's parent would lack the information necessary to ensure that none of these bad consequences will ensue. Thus, to comply with these provisions, it would seem that before tapping public insurance, school officials, at a minimum, must inform the parent of the school's interest in utilizing public insurance benefits; explain exactly what it is that they propose to do, as well as the above-listed constraints on their freedom to do so; seek from the parent (and other relevant sources) the information necessary to make the required determinations; solicit any parental concerns; and give parents a meaningful opportunity to express any such concerns. School officials may not require parents to sign up for Medicaid or other public insurance as a condition for their child receiving services under IDEA. Nor may they require parents whose children are enrolled in public insurance programs to incur any out-of-pocket expenses, such as paying a deductible or co-payment. Whether insurance is public or private, parents and students who suffer financial loss when insurance is used to pay for what should have been a free appropriate public education may recover their losses from the responsible school district. Parents and advocates should also note that while the above specific provisions regarding public and private insurance use come from the IDEA regulations, the U.S. Department of Education/Office for Civil Rights has long opined that schools may not require parents to use health insurance to help pay for services required under Section 504 if doing so would pose a risk of financial loss to parent or child. The direct result of the local education agency's failure to implement the student's educational plan. Alternately, even if the punishment does not result in a change in placement, the school district must consider whether the student's conduct was a manifestation of their disabilities, because punishing a child for conduct that is a manifestation of their disability constitutes discrimination. The holding in Gebser v. Lago Vista Independent School Dist. that damages may not be recovered "... unless a school district official who at a minimum has authority to institute corrective measures on the district's behalf has actual notice of, and is deliberately indifferent to, the teacher's misconduct." has been successfully applied to discrimination cases. Watch Minder - at last, a watch with 30 different programmable alarms! FL ESE Advocates Blog - A place for parents and children to tell their stories to convince legislatures that we need better, stronger laws to protect our students! Statewide Advocacy Network on Disabilities, Inc. - STAND provides information for parents to advocate for their child's FAPE. Florida Dept of Education - Includes links to individual school districts web sites. The material on this Web site represents general legal advice. Since the law is continually changing, some provisions may be out of date. It is always best to consult an attorney about your legal rights and responsibilities regarding your particular case. If you believe you need legal advice, call an attorney. 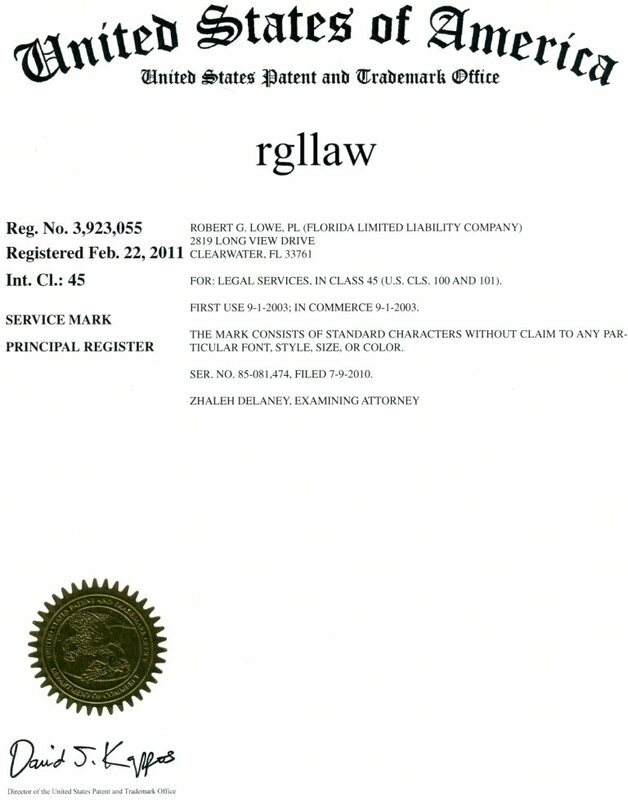 If you do not have an attorney, please contact rgllaw® by e-mail or by phone at 727-647-3700. Or call The Florida Bar Lawyer Referral Service at 1-800-342-8011, or the local lawyer referral service or legal aid office listed in the yellow pages of your telephone book.